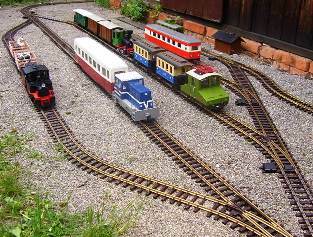 This garden railway is the model of the narrow-gauge railway on a 1:22,5 "G"scalle and with the gauge 45 mm. The railway is plug in to a battery 12V/68Ah. The wait of the railway is 80 m and she go up in 50 promile. The number of the switchis is 21. The models are present the big exemplarys that go at the ouer and forigner narow-gauge railway. The railway in the new location was shortened to 30m and the traction battery was reinforced by 12V on a total of 24V/64Ah. Further expansion of the railway will continue to climb to the upper station.